"Traditional print textbooks have become obsolete.” ~ Ron Jones, owner of an independent academic bookshop in Plymouth, which has had to close after 42 years. When I first started Australian eBook Publisher it was in answer to a looming demand, and a gap, I saw in the marketplace for an Australian-owned and operated ebook publishing service provider. Having worked as a graphic designer, website designer, manager and communicaions and marketing professional since 2006 I knew I had the skills and know-how to learn how to produce ebooks. Businesses like mine have not brought about the downfall of bricks and mortar bookstores; in fact I am sorry to see these faithful and long-standing organisations fail. Australian eBook Publisher is keeping its finger on the pulse, however. Like the music industry before it, book publishing simply has to keep pace with technological change and new audience demands. There are some major concerns that the academic publishers I speak with regularly raise, when it comes to digitisation of their traditional paper-based products. Firstly, how can they protect their content from being plagiarised, printed, copied and pasted, used in a manner it was not intended, or even resold. Secondly, how can students interact with a digital book like they have with the print edition, such as filling in forms, drawing in the boxes, submitting their work for marking, etc. Thirdly, when tablets are only so big, how can we teach in the same way, when some academic texts are on large pages with the full use of the entire spread for the student to refer to one side of the page, and fill their answers on the other. The real question here is, "How can we use the content we've developed for printed books and translate that to digital with minimal change and cost?" The answer is to engage a professional team like mine. You need both designers and editors to achieve this difficult task. You need interface designers, project managers, artists and academics all working together. For this you need a project manager with experience designing interactive ebooks. Enhanced ebooks have been around for a number of years, but so far the support for features like form filling, video, drop-down menus, hover boxes, drawing boxes etc. is limited to Apple. Understanding that the coding aspect of creating enhanced epub was oneously time-consuming and expensive for already-struggling publishers, Apple launched iBooks Author in 2012. In 2016 Amazon's Textbook Creator is in beta. We have already released my children's book as an enhanced Amazon ebook. It is called Myra and the Magic Motorcycle, and has sound effects and Media Overlay (professional narration of text with words highlighted as the audio book plays). So it seems that the academic market is set to make some major inroads to digital publishing in the coming years. But your typical paper-based educational book is not readily transferable to digital formats without careful consideration by your writers and editors, as well as a team of professional ebook designers. 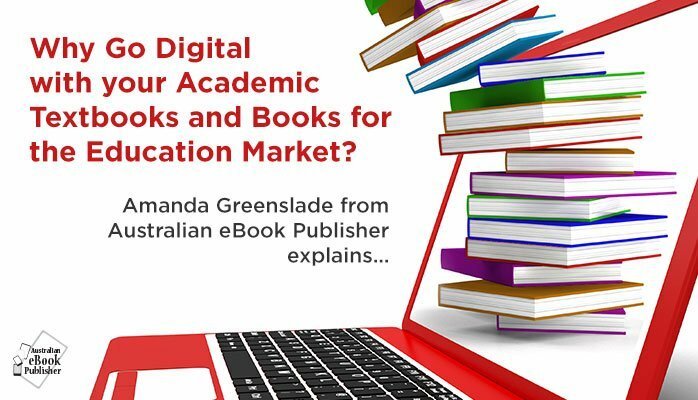 If you need help answering the above questions and concerns, finding a team of people who can help reinvent your academic texts for the digital marketplace, contact us at Australian eBook Publisher.